To get to Nashotah House Theological Seminary, begin in Delafield, Wisconsin. Follow Oakwood Drive west as it turns into Valley Road and continues to go northwest. Turn right onto Mission Road heading north. Nashotah House Seminary is on the left side of the road at 2777 Mission Road. 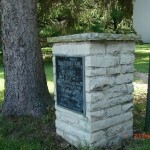 Though Nashotah House Seminary is located near Nashotah, Wisconsin, it is technically located in Delafield, Wisconsin. Bishop Jackson Kemper took the first steps toward creating the Nashotah House Theological Seminary in 1841 when he and three other deacons set out to evangelize to the Onieda and Objibwe people. They hoped to establish ad religious house from which missionaries trained in Christianity would preach to the indigenous nations and eastern pioneers that settled nearby. The first buildings at the Nashotah House Theological Seminary were the Chapel of St. Sylvanus and a little blue house that was located beside it. These buildings still exist today. 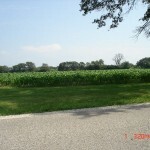 The red shingled house is across the road from a field used to grow corn and other crops. 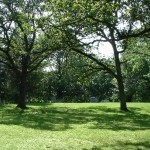 There is a small cemetery near a wooded area on the property as well. 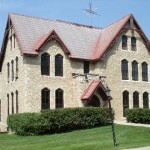 The Nashotah House Theological Seminary is the oldest institution of higher learning in Wisconsin. The ghost of an acolyte is said to haunt the Nashotah House Theological Seminary grounds. According to one source, the acolyte’s wife cheated on him with the Dean of the Nashotah House Theological Seminary. She then killed her husband via hanging. Everyone thought he had committed suicide, according to this source. and he was purportedly buried in a nearby corn field for having committed a mortal sin.